Growing up, a lot of us knew we were queer even before we had a name for our feelings. We knew when our deepest desires didn’t quite fit in with most of the other kids. It took years to come to terms with what it all meant for our future. But Gen Z has it very different. 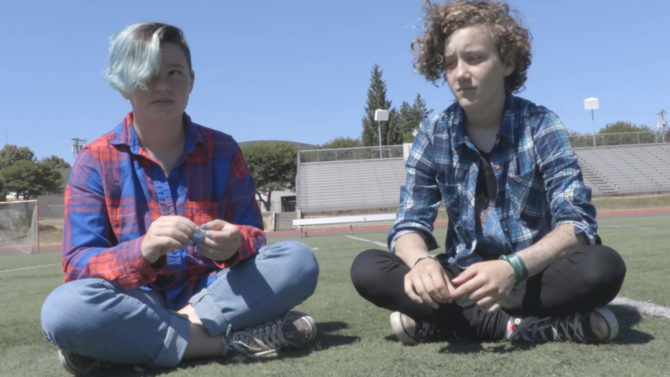 Even as barely adolescent teens, an increasing number grow up in the midst of an earth-shattering conversation, on social media and even in the classroom and dining room table, about our ever-expanding understanding of and even appreciation for sexual orientation and gender identity. This is what directors Matt Alber and Jon Garcia attempt to capture in Room to Grow, a new Revry Original docuseries debuting today in honor of National Coming Out Day. Room to Grow represents a watershed moment, a glimpse into a future where family and society accept queerness as matter-of-fact (along with plenty of struggle). If these kids benefit from the sacrifices of the past, they also represent a bright hope for the future, where all boundaries are obliterated once and for all. In other words: it gets better. See all episodes Streaming on Revry and Revry’s Instagram TV. Queerty has partnered with Revry to bring you the latest series, films and music on Revry on Queerty TV. Queerty TV pulls together the best content from Queerty, the web and our partners, check it out. God, if only I had the support when I was young that young queers have now days in coming out. I most likely would have been a nicer more actualized man with a greater ability to suffer the great number of fools commenting on Queerty. But I didn’t. just saying…. I saw a screening of this at Outfest and was moved to tears. The strength of the kids and the support from their parents is truly touching, I highly recommend.